The Memorial incorporates specific references to elements of the Bomber Command experience. 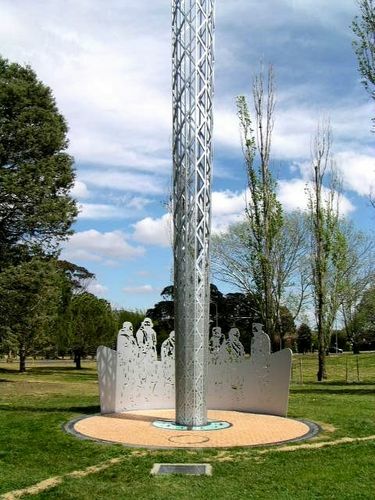 Bombing operations occurred mainly at night and searchlights posed a major threat; the central 16.5 metre high stainless steel tower symbolises these. 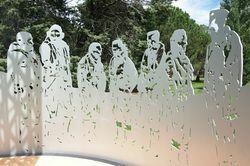 The Bomber Command personnel, both air and ground crew, appear as silhouetted figures in the curved steel screen wall, 4.5 metres in length, 2.3 metres high. 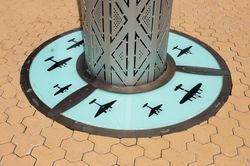 A glass plate at the base of the searchlight beam depicts eight of the aircraft flown by Bomber Command: Blenheim, Halifax, Hampden, Lancaster, Mosquito, Stirling, Wellington and Whitley. 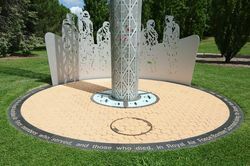 There is a black granite ring surrounding the base of the sculpture engraved with words commemorating the Bomber Command crews and Royal Australian Air Force and Bomber Command insignia. This memorial was unveiled by the Hon. De-Anne Kelly, MP. Minister for Veteran Affairs, on 23rd July 2005. 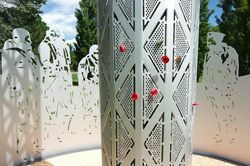 The memorial integrates key elements of the experience of those who served: a searchlight reaching to the sky, the types of aircraft flown, the air and ground crew who flew or maintained them.